A Foodie Bibliophile in Wanderlust: Sam and Dave Dig a Hole - what the heck is up with that ending? Sam and Dave Dig a Hole - what the heck is up with that ending? 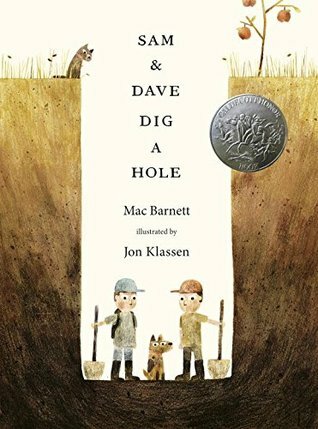 Since Sam and Dave Dig a Hole by Mac Barnett and Jon Klassen is a book that totally perplexed me, and given that it just won a Caldecott honor, I decided to read it to my 8th graders this week. This is a book that spurred much discussion and perplexity in my classroom. I was delighted at the thinking and questioning it sparked. In addition to reading the story as a class, my students read about some of Travis Jonker's theories (they particularly liked the Jesus theory) and came up with some of their own, my favorite being that the book starts at Dave's house and ends at Sam's house. When I told Travis about this theory on Facebook, it led to quite a spirited discussion by teachers, librarians authors, and the like, particularly the idea of whether or not Sam and Dave were brothers or cousins (there's a line in the story that mentions their grandfather, meaning they shared a grandparent). If they were cousins, then beginning at one house and ending at another would be plausible, but not so much if they were brothers. Still, I think I'm just going to embrace the uncertainty and let this story spontaneously insert itself into class discussions for the rest of the year. For instance, "Well, what about Sam and Dave Dig a Hole? That book doesn't have a denouement." (Denouement is their new favorite word to use in class discussions). For those people who don't think picture books should be read to students past 3rd grade, I have just added another book to the pile that cements my argument as to why they are for ALL AGES, not just primary grades. This book is full of complexity and makes a case for the importance of visual literacy (Explain the reasoning behind wanting to show a full spread of the house, the pets, and the tree without Sam and Dave at the end of the book. What is this trying to tell us here?). I have to admit, I missed a lot of the visual cues I was supposed to notice my first (and second!) read-throughs. It was only until students began to point them out that I started to make those connections. So again, please, I beg of you, do not assume that because a book is only 32 pages and has pictures that it is overly simplistic. I can assure you, there are many picture books that can teach literary elements just as well, if not better, than novels.